For heavier cleaning, there are cleaning products, sold in your local grocery store, that can be used to remove soap scum, hard water deposits, and mildew stains. You'll want to consult the cleaner's manufacturer instructions to make sure the product is compatible with your type of tile. After cleaning, rinse well and wipe dry for more shine. 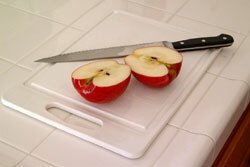 Textured tiles may require mild scrubbing with a soft brush or electric polisher/scrubber. 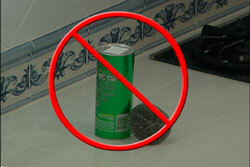 To avoid scratching the surface of the tile, never use abrasive cleaners or steel wool. 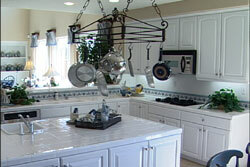 Do not use bleach or ammonia, on a regular basis; these products can discolor your grout. 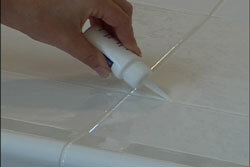 Depending on your lifestyle, sealing of the grout joints on your countertop or wall tile may be an option. After the installation process is complete and your grout has had ample time to cure, sealing the grout can provide protection from dirt and spills, by slowing down the staining process. Ask your Design Consultant for more information about sealing.